Sam Bird says he's still pinching himself ahead of this weekend's Mexico City E-Prix after his stunning start to the season propelled him to the top of the drivers' standings. Bird, whose Virgin team also leads the constructors' championship, is hoping to secure his second successive race victory with a win in the Mexican capital on Saturday. But even though both Bird and his team are flying out in front, the Englishman says he could scarcely have imagined such a scenario before the start of the season. "If you said to me at the end of Valencia testing that we were going to be leading the drivers' and constructors' championship I simply would not have believed you," Bird told CNN. "I feel that the engineers, the mechanics, the data engineers have done such hard work to improve the car at such a drastic level and we're still leading." READ: Will Formula 1 follow Formula E and switch to electric power to survive? Bird flew to the top of the drivers' standings after winning in Santiago. 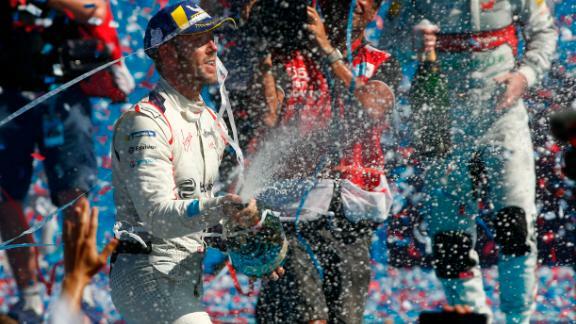 Starting in sixth, the Virgin Racing driver moved up through the field to claim an impressive victory on a day where temperatures in the Chilean capital reached 45 degrees Celsius -- making it the hottest Formula E race of all time. Now Bird, who finished third in the drivers' standings last season, is hoping to continue his stunning start to the season by pulling off yet another success, this time in Mexico. "It's going to be tough, of course it is," he added. "The good thing with it being so competitive though is that people are going to be taking points off each other all the time. It's not like one person is always going to be winning so anyone in this championship can do well."